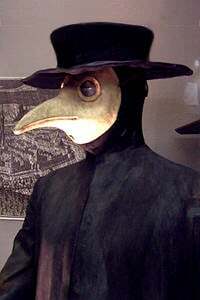 The plague doctors uniform was designed to protect them from contamination…too bad it didnt. The Black Death was the deadliest epidemic of bubonic plague in history. It wiped out some 25 million Europeans alone in just a few years. 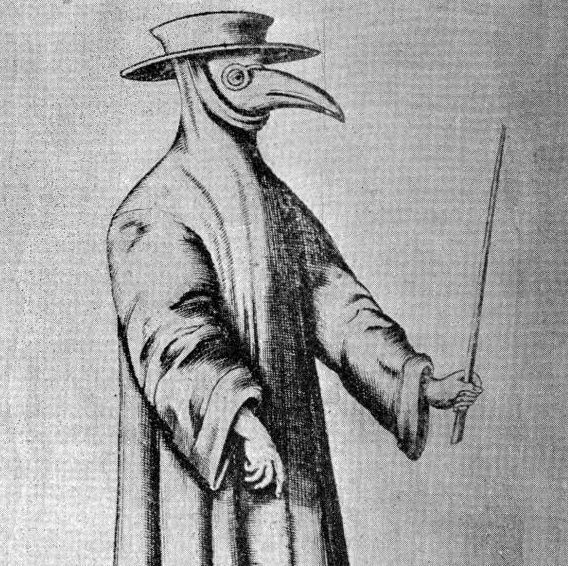 Out of desperation, cities hired a new breed of physician, so-called plague doctors, who were either second-rate physicians, young physicians with limited experience, or who had no certified medical training at all. What was important was the plague doctor was willing to venture into plague-stricken areas and tally the number of dead. After more than 250 years fighting the plague, hope did finally arrive with the invention of the 17th-century equivalent of a hazmat suit. Unfortunately, it didn’t work very well. The primary responsibilities of a plague doctor, or Medico della Peste, were not to cure or treat patients. Their duties were more administrative and laborious as they kept track of casualties, assisted in the occasional autopsy, or witnessed wills for the dead and dying. Unsurprisingly, this meant that some plague doctors took advantage of their patient’s finances and ran off with their final will and testament. More often than not though, these bookkeepers of the plague were revered and sometimes even held for ransom. Hired and paid by the city, plague doctors saw to everybody regardless of their economic status. Though they did occasionally invent their own cures and tinctures which they included with a fee to wealthier patients. It was not immediately obvious to doctors and victims alike how exactly plague spread. By the time of 17th-century though, physicians had subscribed to miasma theory, which was the idea that contagion spread through foul-smelling air. Prior to this time, plague doctors wore a variety of protective suits but it wasn’t until 1619 that a “uniform” was invented by Charles de l’Orme, the chief physician to Louis VIII. The two nostril holes in the mask certainly did little to protect the doctor. Because they believed that smelly vapors could catch in the fibers of their clothing and transmit disease, de l’Orme designed a uniform of a waxed leather coat, leggings, boots, and gloves intended to deflect miasmas from head to toe. The suit was then coated in suet, hard white animal fat, to repel bodily fluids. The plague doctor also donned a prominent black hat to indicate that they were, in fact, a doctor. The doctor also carried a long wooden stick which he used to communicate with his patients, examine them, and occasionally ward off the more desperate and aggressive ones. By other accounts, patients believed the plague to be a punishment sent from God and requested the plague doctor whip them in repentance. Foul-smelling air was also combatted with sweet herbs and spices like camphor, mint, cloves, and myrrh, stuffed into a grotesque mask with a bird-like beak. Sometimes the herbs were set aflame before they were put in the mask so that the smoke could further protect the plague doctor. They also wore round glass goggles. A hood and leather bands tethered the goggles and mask tightly to the doctor’s head. Besides the sweaty and horrifying exterior, the suit was deeply flawed in that it had airholes poked into the beak. As a result, many of the doctors contracted plague and died. 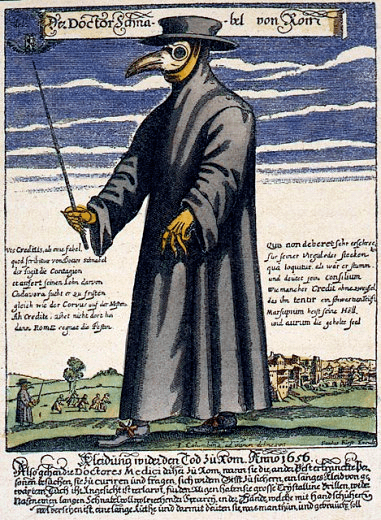 Though de l’Orme was lucky enough to live to an impressive 96, most plague doctors had a very short lifespan even with the suit, and those who did not get sick often lived in constant quarantine. Indeed, it could be a lonely and thankless existence for the plague doctors of yore. Because plague doctors were confronted only with the horrific symptoms and not an in-depth understanding of the disease, they often were allowed to conduct autopsies. These, however, tended to yield nothing. Plague doctors consequently resorted to some dubious, dangerous, and debilitating treatments. Remember plague doctors were largely unqualified, so they had less medical knowledge than “real” physicians who themselves subscribed to incorrect scientific theories. Treatments then ranged from the bizarre to the truly horrific. They practiced covering buboes — puss-filled cysts the size of an egg found on the neck, armpits, and groin — in human excrement which probably spread further infection. They also turned to bloodletting and lancing the buboes to drain the puss. Both practices could be quite painful, though the most painful must have been pouring mercury over the victim and placing them in an oven. Not surprisingly, these attempts often accelerated death and the spread of infection by opening festering burn wounds and blisters. Today we know that the bubonic and subsequent plagues like pneumonic were caused by the bacteria Yersinia pestis which was carried by rats and common in urban settings. The last urban outbreak of plague in the United States occurred in Los Angeles in 1924 and we since have found a cure in common antibiotics. This early hazmat suit and those horrific treatments remain thankfully in the past, but the willingness of plague doctors to separate the sick from the healthy, to burn the contaminated, and experiment with treatments, has not been lost on history.